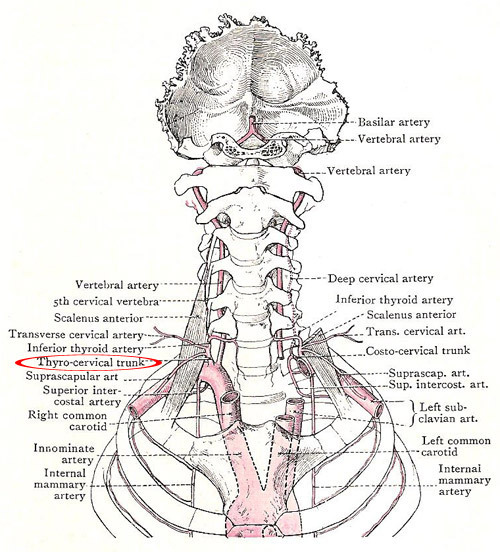 Thyrocervical trunk shown in relation to subclavian arteries and their branches. The thyrocervical trunk is a short, wide branch of the first part of the subclavian artery. It arises from the front of the subclavian artery close to the medial margin of the scalenus anterior, and under cover of the internal jugular vein between the phrenic and vagus nerves. It breaks up almost immediately into three branches – the inferior thyroid artery, the suprascapular artery, and the transverse cervical artery.